07/2010: The building housed a charter school for a few years and was renovated in 2000. It most recently housed the Trenton Central High School North Clinton Campus: Medical Arts Academy. The building does not have any physical threats, but it needs a new use and owner. It is currently for sale. 12/2011: The Crescent Temple has been purchased by the Pentecostal Church Assembly of God, a Hispanic congregation that currently occupies a neighboring building. The congregation’s membership is expanding, and they are in need of additional space. Between the late 19th and mid 20th centuries, fraternal organizations played a major role in American society. Among the most powerful of the societies were the Shriners, who adopted an exotic Moorish/Orientalist symbol system to sustain their rites and practices. 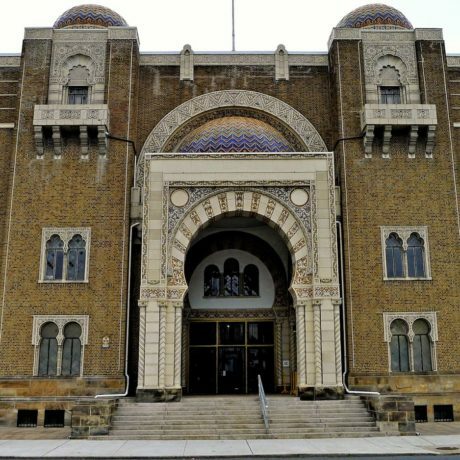 The architectural manifestations of this system are evident in the hundreds of mosque-like temples constructed for the Shriners throughout the United States between 1920 and 1950. Changes in America have diminished the popularity of fraternal orders, and the temples have joined the ranks of redundant buildings in many older urban areas. One casualty of this change is the extraordinary Crescent Temple in Trenton, an outstanding example of its type, and a variation on the exuberant and eclectic entertainment architecture of the nation’s major cities—movie palaces, casinos, banquet halls, ballrooms, and theaters. These buildings are often key anchors in urban neighborhoods, providing identity and vitality in mixed residential/commercial districts. Their loss foreshadows larger social and economic deterioration. Designed by Philadelphia architect and movie house specialist Walter Hankin in 1929, Crescent Temple features decoration in local terra cotta, arch motifs, vast opulent spaces, and high-quality modern construction with durable materials. The auditorium seats 3,000, and a banquet hall on the lower level seats 800. Paradoxically, the building’s size and high costs of upkeep are significant impediments to any viable reuse plans.